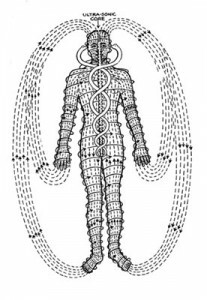 “Pattern forces of the body and their wireless circuits” Dr. Stone wrote many of his teachings in the form of diagrams and charts. This is one of his most iconic graphics. Polarity Therapy is a holistic bodywork modality based on the idea that the flow and balance of energy in the human body is the foundation of good health. The practitioner uses a variety of contacts to stimulate and balance the body’s electromagnetic fields. The practitioner may also help the client process feelings and emotions and develop specific strategies for reducing stress and increasing wellness. Polarity Therapy was developed by Dr. Randolph Stone, DO, DC, ND (1890-1981), who conducted a thorough investigation of energy in the healing arts over the course of his 60-year medical career. Drawing on information from a wide range of sources, he found that the Human Energy Field is affected by touch, diet, movement, sound, attitudes, relationships, life experience, trauma and environmental factors. Since Polarity Therapy lends an energy-based perspective to all these subjects, the scope of Polarity practice is often very broad. Polarity is experienced as the universal pulsation of expansion/contraction or repulsion/attraction known as Yang and Yin in Eastern medicine. Energy moves out from a central source – which is repulsion, then back to the source – which is attraction. Polarity practitioners use this natural phenomenon as a way of tracking energy flow.